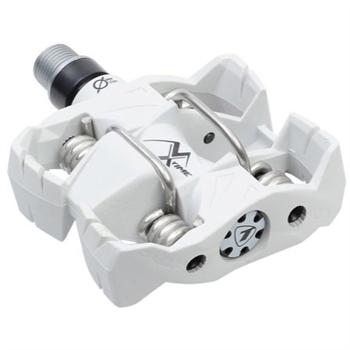 The ATAC concept (Auto Tension Adjustment Concept) is a patented mechanism that allows a hardness setting for foot support, independent of spring tension. Combined with a choice of release angle of 13deg or 17deg, the ATAC provides total reliability in engagment and release and allows you to bike with confidence and security regardless of the terrain (mud, sand, gravel...). With its retention located frontally, whenever you clip into the TIME ATAC pedal, the cam drives the mud or sand out, guaranteeing perfect operation even in the most extreme conditions. Angular float (TIME patent) in the pedal allows your foot freedom of movement, protecting knees and joints from excess wear. With TIME ATAC pedals, you are ready to go, even faster!